If you've never sewn clothes before, a simple gathered skirt is a good garment to begin with. All that's involved is sewing a few straight lines of stitching and adding some elastic. 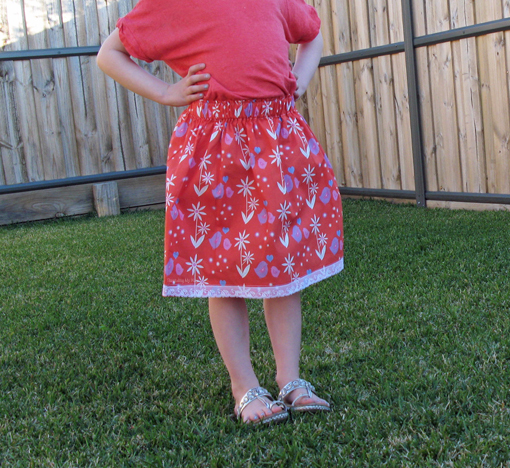 Today's tutorial will show you just how easy it is to sew a gathered skirt for a little, or not so little girl. This skirt was sewn for a girl with a waist measurement of 20" (51cm) and a waist to knee measurement of 15" (38cm). Cut one rectangle of fabric according to the measurements above. My fabric measured 40" x 18" (102cm x 46cm). 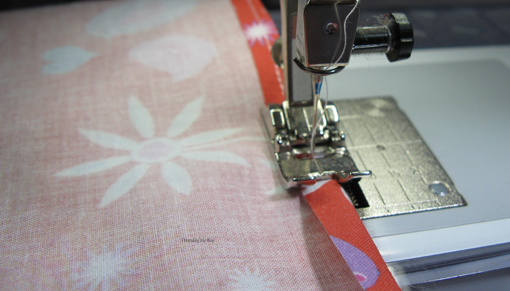 If the fabric is not wide enough, cut two rectangles half the width - 20" x 18" (51cm x 46cm). If you have one rectangle of fabric, you will have one seam at the back. If you have two rectangles of fabric, you will have two side seams. 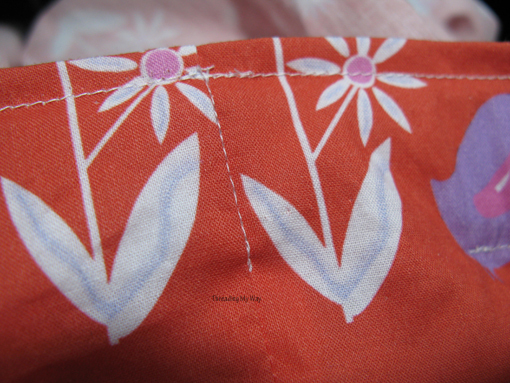 With right sides together, sew ⅜" (1cm) seam(s). 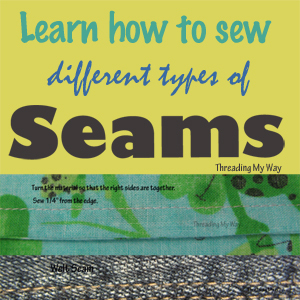 Neaten seam(s) with an overlocker (serger) or a zigzag stitch. Turn under ¼" (6mm). Most tutorials will tell you to press the ¼" (6mm) turn and this will look the best. However, I sew the first turn with a row of stitching, as it will only be seen on the wrong side and it saves me getting up to iron. Fold the top over 1½" (4cm). Baste (hand sew) to hold in place. Stitch as close as you can to the hem of the casing, 1/16" (16mm), leaving a 2" (5cm) opening in the middle of the back, to feed the elastic into. 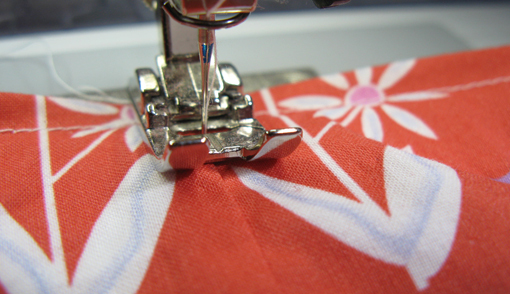 Sew a 2nd line of stitching ¼" (6mm) from the top edge of the skirt. This is what it will look like from the right side. Note that at this point, I discovered that my fabric was upside down!!! 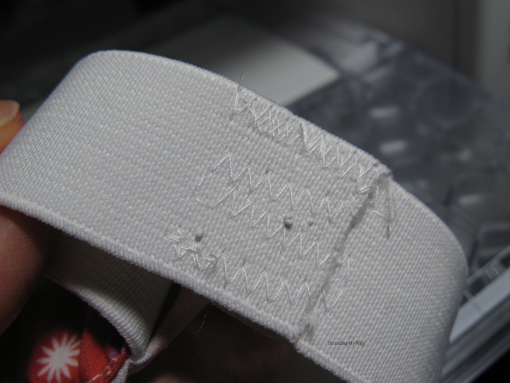 So, this meant unpicking the two rows of stitching you can see. No big deal. 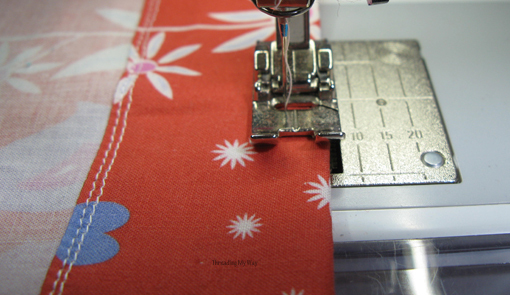 You will learn as you sew, that your un-picker (seam ripper) is your best friend. I forgot to retake photos when I redid the waistband, hence upside down fabric. I cut elastic 1½" (4cm) to 2" (5cm) shorter than the waist measurement. It all depends on the stretch of the elastic. 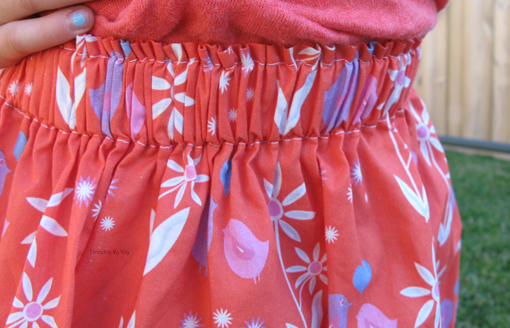 Try the elastic around the waist of the child and see what length feels comfortable. 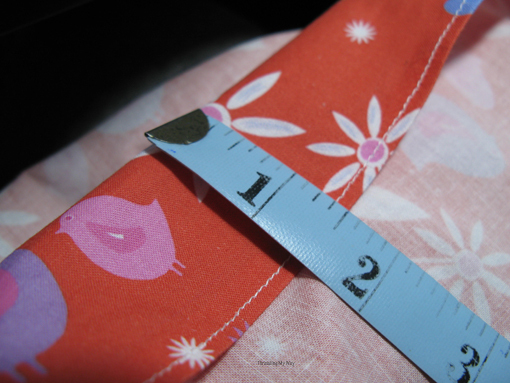 For a waist measurement of 20" (51cm), I made the elastic 18½" (47cm). Feed the elastic into the casing through the opening, making sure you leave the other end sticking out of the opening. 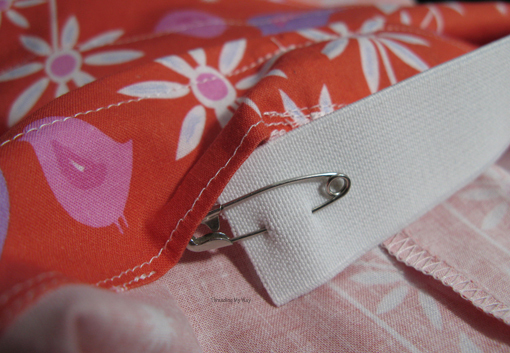 Remove the safety pin and stitch the elastic ends together. Overlap about ½" (1.5cm). Basting (hand sewing) one side of the elastic will make it easier to keep the elastic together. Push the ends back into the casing. 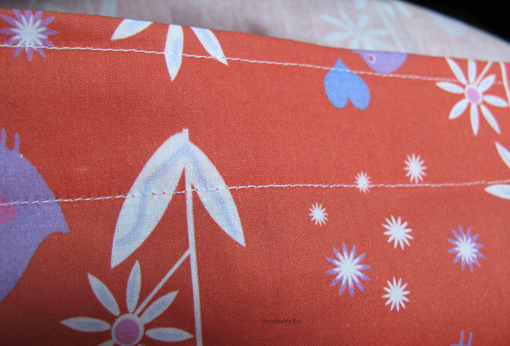 Spread out the elastic so it is even all the way around, leaving the join at the centre back seam. 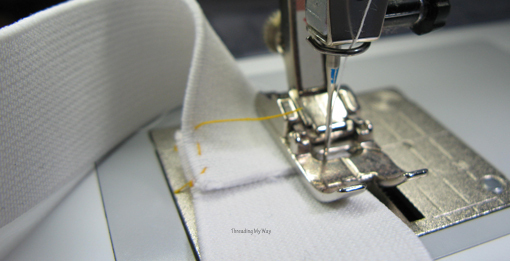 Sew through the casing and elastic at the back seam and/or side seams (stitching in the ditch). This will prevent the elastic from twisting in the casing. All that's left is the hem. Turn under 1/4" (6mm) and press or stitch. I added a row of lace on top of the hem, just to jazz it up a little. That's it! Your skirt is finished. If this is your first garment, congratulations!!! 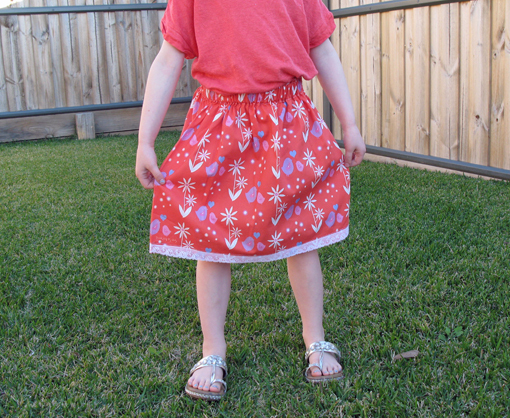 I've whipped up this little skirt with fabric from Spoonflower - Mumma and Bubba designed by my daughter, Little Ladybird. 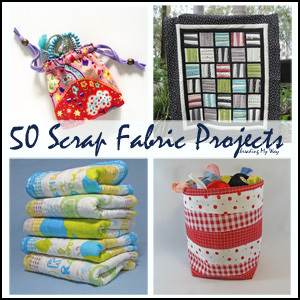 Spoonflower are continually adding to the types of fabric available for purchase. 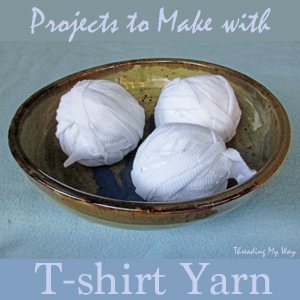 I like to use the Kona Cotton for projects such as this. 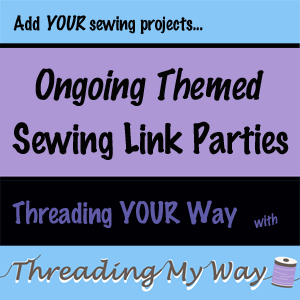 If you make a gathered skirt following these directions, I'd love you to share pics in the Threading My Way ~ Sewn by YOU Flickr group, leave me a link in the comments, or add it to the ongoing Skirts for Girls link party, here at Threading My Way. This is so cute. I can't wait until my grand daughter is old enuf for skirts. Pam, this skirt is adorable. I think that the fabric is delightful! It really is pretty fabric! Posts like this are the ones that make people decide to start sewing. Good job!! Great tutorial, Pam! 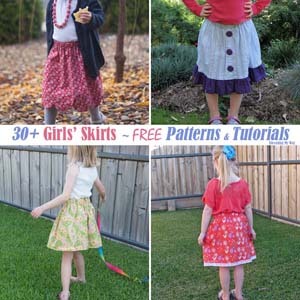 There may be many tutorials for a simple gathered skirt, but I have not seen one with the tip of stitching in the ditch. Hand basting is a great tip too! Gran tutorial!!! Esta muy bien ilustrado y la falda fantástica!!! 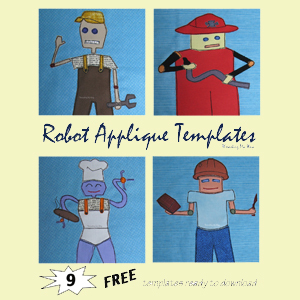 and would love for you to stop by and share your project. Hope to see there! 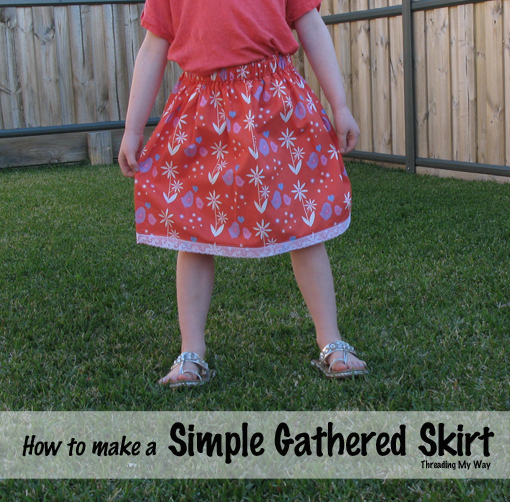 What a cute skirt and a great tutorial, thanks Pam! That is super cute! 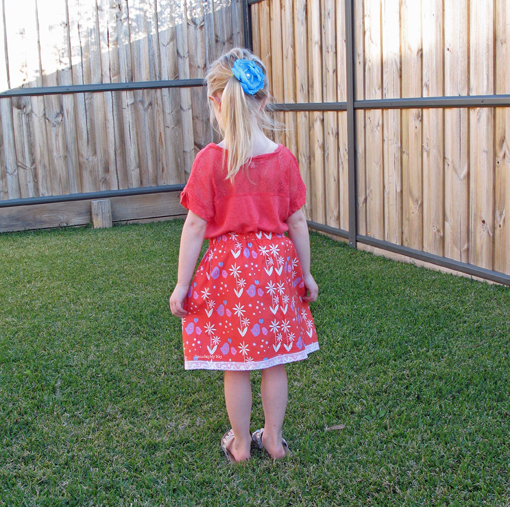 I made several simple dresses & skirts for my daughters when they were young. 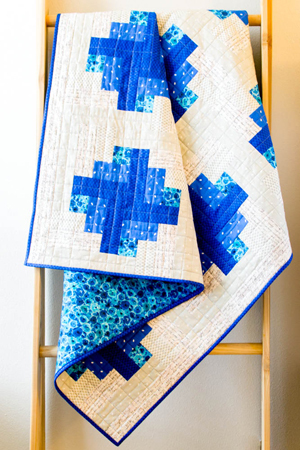 But quilting definitely took over! That is cute and I think I could even pull it off with my sewing impairment! LOL Pinned it to try later. 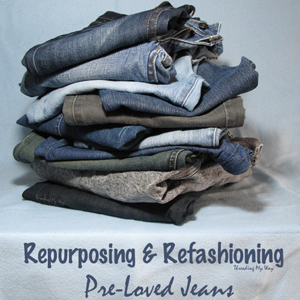 Found your blog on Inspiration Board link party and started following on Google +. Thanks, Erin. 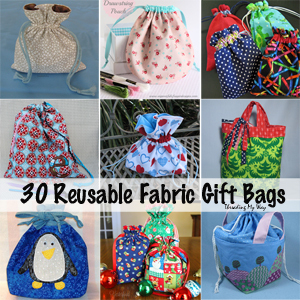 It really is easy to make, even if you're very new to sewing. Thanks for stopping by. I love a simple gathered skirt even for myself. 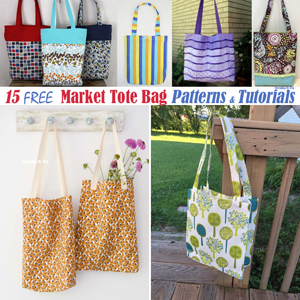 They are easy to make and the fabric you chose is so pretty. What a cutie of a model you have there too! I do a lot of charity sewing and am certainly going to try this cute pattern out. Thanks so much!